Sean McManus teaches you what you need to know about creating websites that are both effective and easy to use. Here, you can find the code examples used in the book. You can open them in your browser and view the source code of them. Alternatively, you can right click on one of the links to save the linked file to your computer. You're welcome to use the code here in your own websites, but please do not post the example images or text content online. If you do use any of these code examples in your site, please consider leaving a credit for the book in your web page source. Thank you! To visit the example sites used in screenshots in the book, and find further webmaster tools and tutorials, see the page of links from the book. 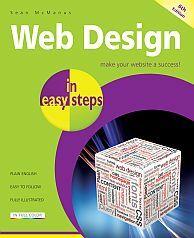 Web Design in Easy Steps is available to order from all good book shops. Structuring your HTML pages - first basic example, with doctype, head, title, body, h1 and p tags. After you've marked up your content structure using HTML, you can use CSS to change its appearance. The book Web Design in Easy Steps introduces the key concepts of cascading style sheets (CSS) and concludes with some examples of more sophisticated effects and layouts. Below are the examples from the book. So that all the demo code can be in a single easy-to-use file, the style declarations are at the top of the HTML file. As the book explains, it's usually better to use a separate style sheet for them. The book includes a walkthrough showing you how to create a simple Flash animation using Adobe Flash. Above, you can see it in action. I made some modifications to the file that there wasn't room to explain in the book: I used the deco tool to add a few tree branches and a patch of flowers, converted them to symbols and then reused them extensively. That enabled me to bring the file size down dramatically.